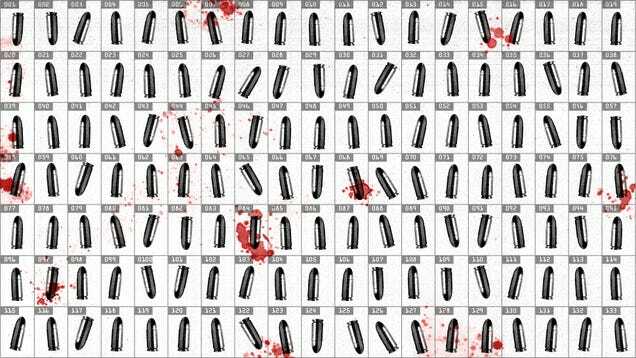 A few days ago, Deadspin's Kyle Wagner began to compile a list of all police-involved shootings in the U.S. He's not the only one to undertake such a project: D. Brian Burghart, editor of the Reno News & Review, has been attempting a crowdsourced national database of deadly police violence. We asked Brian to write about what he's learned from his project. It began simply enough. Commuting home from my work at Reno's alt-weekly newspaper, the News & Review, on May 18, 2012, I drove past the aftermath of a police shooting—in this case, that of a man named Jace Herndon. It was a chaotic scene, and I couldn't help but wonder how often it happened. I went home and grabbed my laptop and a glass of wine and tried to find out. I found nothing—a failure I simply chalked up to incompetent local media. A few months later I read about the Dec. 6, 2012, killing of a naked and unarmed 18-year-old college student, Gil Collar, by University of South Alabama police. The killing had attracted national coverage—The New York Times, the Associated Press, CNN—but there was still no context being provided—no figures examining how many people are killed by police. I started to search in earnest. Nowhere could I find out how many people died during interactions with police in the United States. Try as I might, I just couldn't wrap my head around that idea. How was it that, in the 21st century, this data wasn't being tracked, compiled, and made available to the public? How could journalists know if police were killing too many people in their town if they didn't have a way to compare to other cities? Hell, how could citizens or police? How could cops possibly know "best practices" for dealing with any fluid situation? They couldn't. The bottom line was that I found the absence of such a library of police killings offensive. And so I decided to build it. I'm still building it. But I could use some help. You can find my growing database of deadly police violence here, at Fatal Encounters, and I invite you to go here, research one of the listed shootings, fill out the row, and change its background color. It'll take you about 25 minutes. There are thousands to choose from, and another 2,000 or so on my cloud drive that I haven't even added yet. After I fact-check and fill in the cracks, your contribution will be added to largest database about police violence in the country. Feel free to check out what has been collected about your locale's information here. The biggest thing I've taken away from this project is something I'll never be able to prove, but I'm convinced to my core: The lack of such a database is intentional. No government—not the federal government, and not the thousands of municipalities that give their police forces license to use deadly force—wants you to know how many people it kills and why. It's the only conclusion that can be drawn from the evidence. What evidence? In attempting to collect this information, I was lied to and delayed by the FBI, even when I was only trying to find out the addresses of police departments to make public records requests. The government collects millions of bits of data annually about law enforcement in its Uniform Crime Report, but it doesn't collect information about the most consequential act a law enforcer can do. I've been lied to and delayed by state, county and local law enforcement agencies—almost every time. They've blatantly broken public records laws, and then thumbed their authoritarian noses at the temerity of a citizen asking for information that might embarrass the agency. And these are the people in charge of enforcing the law. The second biggest thing I learned is that bad journalism colludes with police to hide this information. The primary reason for this is that police will cut off information to reporters who tell tales. And a reporter can't work if he or she can't talk to sources. It happened to me on almost every level as I advanced this year-long Fatal Encounters series through the News & Review. First they talk; then they stop, then they roadblock. Take Philadelphia for example. In Philadelphia, the police generally don't disclose the names of victims of police violence, and they don't disclose the names of police officers who kill people. What reporter has time to go to the most dangerous sections of town to try to find someone who knows the name of the victim or the details of a killing? At night, on deadline, are you kidding? So with no victim and no officer, there's no real story, but the information is known, consumed and mulled over in an ever-darkening cloud of neighborhood anger. Many Gawker readers watched in horror as Albuquerque police killed James Boyd, a homeless man, for illegal camping. Look at these stats, though (I don't know if they're comprehensive; I believe they are): In Bernallilo County, N.M., three people were killed by police in 2012; in 2013, five. 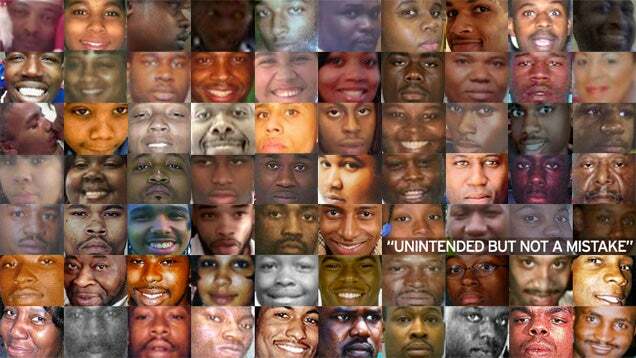 In Shelby County, Tenn., nine people were killed by police in 2012; in 2013, 11. There are many other ways that bad or sloppy journalism undermines the ability of researchers to gather data on police shootings. Reporters make fundamental errors or typos; they accept police excuses for not releasing names of the dead or the shooters, or don't publish the decedents' names even if they're released; they don't publish police or coroner's reports. Sometimes they don't show their work: This otherwise excellent St. Louis Post-Dispatch article claims there were 15 fatal shooting cases involving law enforcement agencies between January 2007 to September 30, 2011—but provides few names and dates for further research efforts. And that list doesn't even get into fundamental errors in attitude toward police killing—for example, the tendency of large outlets and wire services to treat killings as local matters, and not worth tracking widely. Even though police brutality is a national crisis. Journalists also don't generally report the race of the person killed. Why? It's unethical to report it unless it's germane to the story. But race is always germane when police kill somebody. This is the most most heinous thing I've learned in my two years compiling Fatal Encounters. You know who dies in the most population-dense areas? Black men. You know who dies in the least population dense areas? Mentally ill men. It's not to say there aren't dangerous and desperate criminals killed across the line. But African-Americans and the mentally ill people make up a huge percentage of people killed by police. But maybe most important thing I learned is that collecting this information is hard. I still firmly believe that having a large, searchable database will allow us not just better understanding of these incidents, but better training, policies and protocols for police, and consequently fewer dead people and police. But normal people don't much care about numbers. Trolls intentionally try to pollute the data. Subterranean disinformationists routinely get out fake numbers. I try to take advantage of the public passion when when an incendiary event happens, like the death of Kelly Thomas, James Boyd, Eric Garner or Michael Brown. Or when a Deadspin writer decides to get involved. My girlfriend calls this "riding the spike." I call it journalism. Or maybe, obsession. Fatal Encounters can be found here, and is on Twitter at @FatalEncounters. Deadspin's submission form can be found here. NEW YORK (AP) — At least 400 people are killed by police officers in the United States every year, and while the circumstances of each case are different, one thing remains constant: In only a handful of instances do grand juries issue an indictment, concluding that the officer should face criminal charges. Successful prosecutions generally involve officers who have lied about what they've done, tried to cover up their actions, or used excessive force to inflict punishment. It is difficult to generalize about why some cases lead to criminal charges, while others do not, but history shows that jurors may have less sympathy for officers who are guilty of more than just poor judgment during a crisis. Police who get caught lying tend to get charged. So do those who use force to inflict punishment rather than to protect themselves, or who instigate physical confrontations for reasons that seem personal, rather than professional. "If an officer goes rogue, really, and is acting personally, and not as an officer of the law, that's when you'll see a criminal charge," said Candace McCoy, a professor at the John Jay College of Criminal Justice in New York. Philip Matthew Stinson, a professor at Bowling Green State University in Ohio, who has been studying a database of 10,000 police arrests for various types of misconduct, said judges and juries are perfectly willing to throw the book at an officer — if they did something that went beyond their official duties, like robbing a drug dealer or using the authority of their badge to settle a personal score. "If the jury is sitting there thinking, 'Oh my God. A split-second decision like that? What would I have done? Would I have shot the guy?' you're not going to get an indictment," he said. Second-guessing an officer's judgment can get even harder if there are conflicting accounts about what happened. That was the case in the death of Michael Brown, the unarmed 18-year-old shot to death in Ferguson, Missouri. Witnesses disagreed about whether he was charging the officer when he was killed or was trying to surrender. When prosecutors do bring charges, they have often been linked to an attempt at a cover-up. That was the case with the death of Raymond Robair, a 48-year-old handyman who was fatally beaten on a New Orleans street in 2005. The police officers who initially brought Robair to the hospital claimed that they had found him beneath a bridge. In written reports, they described their encounter with Robair as a medical call. Witnesses told a different story. They said one of the officers, Melvin Williams, had beaten the man with his baton. An autopsy concluded he died from a ruptured spleen. When interviewed by the FBI, Williams' rookie partner, Matthew Moore, claimed that Robair had hurt himself when he fell down while trying to run away. An initial police investigation didn't result in any charges, but the case got a second look in 2008 when the FBI began probing killings by New Orleans police officers in the days after Hurricane Katrina. Federal prosecutors ultimately brought civil rights charges. Williams was convicted and sentenced to more than 21 years in prison. Moore was sentenced to five years for conspiracy and lying to federal agents. "It's really, really difficult to get a successful state court prosecution," said Mary Howell, a New Orleans civil rights attorney who has represented victims of police misconduct. One reason, she said, is that prosecutors are reluctant to put the police on trial. Another is that grand juries look for a high level of proof that an officer has done wrong. "It really is one of those rare instances where there is a presumption of innocence," she said. If getting an indictment is tough, getting a conviction is even harder, especially in deaths involving a shooting. Over the past 15 years in New York City, nine police officers have been indicted in four shooting deaths. Only one officer was convicted, and his punishment was light. Officer Bryan Conroy was sentenced to probation and 500 hours of community service in 2005 for the fatal shooting of an unarmed, innocent West African immigrant, Ousmane Zongo, during a warehouse raid in Manhattan. Two infamous cases ended with acquittals. Jurors exonerated four officers of second-degree murder in the 1999 shooting of Amadou Diallo, another unarmed West African immigrant. A judge in Queens acquitted three detectives in the 2006 shooting of Sean Bell, a groom-to-be who was shot leaving a nightclub the morning of his planned wedding. One of the nine officers was indicted by a Bronx grand jury for shooting an unarmed, 18-year-old marijuana suspect, Ramarley Graham, following a foot chase in 2012, but the indictment was tossed out by a judge for technical reasons and a new grand jury cleared the officer. Those acquittals all involved officers who made a snap judgment to fire their weapons after they thought they saw a weapon. Officers are often seen as being more likely to face charges in fatal beating cases, which often involve more sustained violence during which police might have more time to think about what they are doing. Indictments in shootings are especially rare. In Oakland, California, an officer was convicted of involuntary manslaughter in 2010 for shooting an unarmed man in police custody on a train station platform. The officer said he meant to use a stun gun on the victim, Oscar Grant, and pulled his firearm by accident. A similar scenario led to assault charges being filed against an officer in Springfield, Missouri, in July. The officer, Jason Shuck, told an investigator he meant to fire his stun gun at a fleeing panhandler, but shot him with his firearm instead. McCoy said if policymakers really want to do something about fatal encounters between police and the public, charging more officers with crimes isn't the answer. "Within police departments, they are doing what we, as a citizenry, have told them to do, which is over-incarcerate, arrest people for minor crimes, and use force — justifiable force — to subdue people. "And then we wonder why the police have bad outcomes," she said. "This is what the citizenry has told them to do." I'm glad this was pointed out. I was just having a similar conversations with someone whose kid got caught up in a zero tolerance school flap. psychopathy and narcism! If they score high on these two they can become a cop!!! Zero tolerance is what drives the economy of industrial imprisonment. Cops gaining their own personal vision of "zero tolerance" is what gives them permission to do the extralegal things they do. I have no doubt that the for profit prison business has escalated our fears, just like the for profit education system has convinced us our public schools aren't working. of course the public schools aren't working! Unless you define workings as killing creativity , logic and what have you! Code:Cops gaining their own personal vision of "zero tolerance" is what gives them permission to do the extralegal things they do. So why don't you fess up and tell us what you got busted for...you were caught wanking it in public, right? We asked for this. We asked our schools to treat teachers like robots and to make our kids docile data points. We asked our police to make us "safer" by locking everyone up, they did it, and now we're afraid of the police. Also, I'll wager that the US is still one of the most innovative countries in the world despite our "teachers killing creativity". We didn't ask for anything! It was purposely created this way! All this by design! Even from the start! How many people lost their houses? Right!!!! So when some thug is breaking into your house who do YOU call, the fire department???? Well, well, this one was very irrelevant! I am only stating the fact that people have to be a narc or o psycho to get recruted into the police. That is at the moment a fact. The best way to make a police state! It is not coming, it is here!!! This article solved a lot of questions for me. It certainly isn't the first time the U.S. has suffered terribly because of bad Supreme Court decision. To many who saw the video of a New York police officer applying a chokehold to Eric Garner before he died, the decision about whether to charge the officer was an easy call. They were shocked that a grand jury in New York failed to indict officer Daniel Pantaleo, particularly since the officer was white and Garner was black. But it’s not what’s on a video that matters so much under the law. Nor is it even whether the officer did or did not harbor racial prejudice. It’s what was going through the mind of the cop in the few seconds when he chose to use force that counts and whether his decision was “reasonable” under the circumstances at that time, not with the benefit of hindsight. You seem pretty familiar with that sort of thing, and you did bring it up - sooooo when were you arrested and did the constable need a 10x or 20x magnifier to determine if you were beating off or just scratching a pimple? No...it's extremely relevant. If what you say is true you must not be utilizing then in a crisis, so who do you call? And if you're still using them why are you complaining? 12-year-old Tamir Rice was shot by Cleveland rookie police officer Timothy Loehmann on Nov. 22 and died hours later. An investigation into his death is currently underway. posted on Dec. 8, 2014, at 5:58 p.m.
On a Saturday afternoon in late November, Tamir Rice was shot by police while playing in a park across from his mom’s house. The 12-year-old boy was carrying a toy pistol with the orange indicator removed. In pictures, the Airsoft BB gun looks almost identical to a real weapon. Minutes later, police arrived at the park and pulled their car within feet of Rice. Cleveland Police Officer Frank Garmback, 46, drove the patrol car, and a rookie officer, Timothy Loehmann, 26, rode in the passenger seat. Before the vehicle came to a complete stop, Loehmann opened the passenger side door and shot Rice in his torso. A police statement said that the officers asked Rice to raise his hands but the boy instead reached for the gun at his waist. According to Jeffrey Follmer, the Cleveland Police Patrolmen’s Association president, Garmback called in to the station right after the incident. “It’s already a mess,” he said. “We have a 20-year-old male shot.” A full four minutes later, the officers began administering first aid to Rice. Rice was eventually taken to a hospital where he had surgery. He died early in the morning on Nov. 23. Three days later, the Cleveland police department released a video of the incident which shows that Loehmann shot Rice within two seconds of arriving on the scene. The police say they feared for their lives, but the family says the shooting was unnecessary. Both officers have been placed on administrative leave while an investigative team looks into the shooting. Who are the officers involved? Timothy Loehmann, the 26-year-old rookie cop who shot Tamir Rice, became a Cleveland police officer just eight months ago in March 2014. Documents obtained by BuzzFeed News revealed that when Loehmann left his old job as a cop in Independence, Ohio, he was in the process of being fired for dismal performance, but was given a chance to resign before this happened. Loehmann failed to disclose his troubles in Independence in his Cleveland police application. The Cleveland Police told BuzzFeed News they never asked the City of Independence for his personnel file. Father Gerard Gonda, president of Benedictine High School in Cleveland, where Loehmann graduated high school in 2007, described him as polite, kind, mature, congenial, and gentle. Gonda said he has remained close with Loehmann and left him a voicemail after the shooting, but has not heard back. Friends and former classmates of Loehmann expressed support for him online, but all declined BuzzFeed News’ request to comment. Multiple phone calls to Loehmann’s house were not answered. Loehmann and his brother, Tom, have both deleted their Facebook accounts. Following the shooting, the Cleveland Division of Police released the personnel files of Loehmann and his partner, Frank Garmback. The 46-year-old Garmback’s personnel file does not include any other incidents since he was appointed to the force in 2008 where excessive force was questioned. In 2011, Officer Garmback received an award after he shot a robbery suspect. Calls to Garmback’s family and friends were not returned. Samaria Rice spoke out for the first time after her son’s death on Monday. According to Samaria Rice, after the shooting two boys knocked on her front door and told her that her son had been shot. She then ran across the street to see what happened. When she arrived at the scene, she says she found her son lying on the ground bleeding, her 14-year-old daughter who was with him in the back of a police car, and the police standing around. Her daughter later told her that police tackled and handcuffed her. Samaria Rice said she was stopped by police and threatened with arrest if she didn’t calm down. At the news conference, Samaria Rice said she wants “a conviction” against the cop who shot her son. She has retained attorney Ben Crump, lawyer for the families of Trayvon Martin and Michael Brown Jr., in the case. Rice’s family is also suing the officers involved and the City of Cleveland for the wrongful death of Tamir Rice. How did the police change their story? In statements given shortly after the shooting, police officials said that Rice was with a group of boys when he was shot, Cleveland.com reported. Follmer said that Loehmann saw Rice take what looked like a pistol under a table in the park and put it into his waistband. These statements are inconsistent with the video released by Cleveland police on Nov. 26. The family’s attorney, Timothy Kucharski, confirmed that Rice went with friends to the park on Saturday, but throughout the seven-minute video, Rice is alone. There is no group of boys visible anywhere nearby. When the police approach Rice, he is standing next to the gazebo, and the gun is not visible. Rice makes no movements to reach under a table when the police arrive or in the seconds before the police car enters the frame. Speaking to BuzzFeed News, Follman said that the Loehmann saw Rice take the gun off the top of the table and put it in his waistband as the police car was driving toward the park. It’s possible the gun was on the table. The video is too blurry to confirm or deny this. Rice does reach toward his waistband right before he is shot. While it’s possible that the officer told Rice to raise his hands three times, Rice is shot within two seconds of the police car arriving on the scene. Follman told BuzzFeed News that Loehmann had shouted the demands from the car as they were driving toward Rice, but the car moves very quickly and pulls up within feet of Rice. In a press conference on Nov. 24, Cleveland Police Chief Calvin Williams said that the video corroborated the officer’s initial description of the shooting, but that they had not yet taken “official statements” from the officers who shot Rice. The police department confirmed to BuzzFeed News that they have now received official statements from the officers, but did not release further details about whether Loehmann and Garmback’s stories had changed. How did the local media cover Rice’s family? Following the shooting, a series of articles published on Cleveland.com, the online arm of the Cleveland Plain Dealer and Northeast Ohio Media Group, focused on the criminal records of the family. The articles drew a negative response online from many online readers who found the depiction of Rice and his parents unnecessary and offensive. The first critical article was a story that ran the day after the shooting that confirmed through a spokesperson for the Cuyahoga County Juvenile Court that Rice did not have a record at the time of his death. On the same day, Cleveland.com reported that Kucharski also defended Rice’s mother, Samaria Rice, in a drug trafficking case in 2012. Two days later, on Nov. 26, the site posted a story citing court records that show Rice’s father, Leonard Warner, has multiple convictions on domestic violence charges. Critics found these details irrelevant to the shooting death investigation of Rice and called it character assassination — likening the stories to the criticism against 18-year-old Michael Brown after he was fatally shot by a police officer in Ferguson, Missouri, on Aug. 9. Kucharski told BuzzFeed News that he had no update or comment from the family on any of the reports following Rice’s death. “They are just trying to bury and mourn their 12-year-old son right now,” Kucharski said. What is happening with the investigation? A deadly force investigation team comprised of homicide detectives, forensic scientists, and members of the Cleveland police department is currently investigating Rice’s death. The team will review the officer’s technical tacticals, as well as conducting an overall review of the shooting. Investigators are looking into why the officers drove within feet of Rice, instead of parking at a distance and providing Rice the chance to surrender, a spokesperson for the Cleveland police department confirmed. The police union defend the decision to approach Rice directly. The officers assumed Rice would run, Follman said. They drove onto the grass as a precautionary tactic. When Rice did not run, Garmback attempted to slow the vehicle but the car slid, Follman said. Follman additionally defended the decision to shoot immediately, even though Rice was not directly threatening anybody in the park. Another aspect of the incident that may be investigated is why the officers waited four minutes to begin administering first aid, which Cleveland police confirmed. Case Western Reserve University School of Law Professor Lewis told BuzzFeed News that the time that passed before the officers began helping Rice was unacceptable. But Follman and the police union don’t believe it’s unusual or wrong. Once the deadly force investigation team finishes compiling all evidence and taking statements from officers and witnesses, they will file all documents with the Cuyahoga County Prosecutor’s office. What are the chances for indictment? The prosecutor, Timothy J. McGinty, will then determine whether or not there is enough evidence to prove that a crime may have occurred. If he believes there is, the case will move on to the grand jury. If the prosecutor feels that the shooting of Rice is justified, the case will not face a grand jury. Case Western Law Professor Lewis R. Katz described McGinty as a “straight shooter” who has wanted the prosecutor job his whole life. McGinty was the prosecutor for a high-profile case in Cleveland last year in which 137 shots were fired on unarmed suspects in a police chase. Of the 13 officers who fired shots, one was indicted and five supervisors were charged with dereliction of duty for failing to control the chase. In Ohio it is legal to openly carry a gun in public. With a license, it is also legal to carry a concealed weapon. According to Katz, had police arrived on the scene and seen Rice waving the gun around, the officers would be entitled to shoot. But he’s not sure if that law applies to children. It is unclear what Loehmann or Garmback told their supervisors about what exactly happened and if they were in fear when they encountered Rice. The Cleveland Police have not released the incident report or Loehmann and Garmback’s statements to the public. A police spokesperson told BuzzFeed News they have no intention of releasing that information at this time. BuzzFeed News has filed an open records request for the release of the officers’ statements and the incident report. posted on Dec. 3, 2014, at 3:16 p.m. The Independence documents offer a damning and troubling account of Loehmann’s emotional state and ability to follow directions. In the personnel file, Sgt. Tinnirello reported three other incidents in which he was concerned about Loehmann’s behavior. Cleveland police told BuzzFeed News that while there was no review of Loehmann’s file, there is no “written policy mandating a review of an applicant’s previous employer personnel file.” They will now change that. “While our policy does not require obtaining a personnel file prior to employment, the Cleveland Division of Police has amended our policies to request a personnel file from previous employers,” a Cleveland police spokesperson said. “I recall several phone calls and several folks coming in during that time. I can’t recall what agencies they worked for,” Lubin said. A personnel file on Loehmann released this week by the Cleveland Police Department only shows that the city requested Loehmann’s start date, termination date, and sick hours from Independence. Loehmann’s woes in Independence becoming public call into question several details that were reported this week. In his application to become a Cleveland police officer, Loehmann made no mention of his troublesome employment in Independence. Instead, he said that he “resigned for personal reasons” from the department, and wrote that he faced no disciplinary actions. Jeffry Follman, the President of the Cleveland Police Patrolman’s Union, did not immediately respond to BuzzFeed News’ request regarding if Polak’s description of Loehmann was consistent with his behavior as a Cleveland police officer. Rumain Brisbon, 34, was killed Tuesday night by a white cop in an incident that shares similarities to racially charged events in Ferguson and New York City that have sparked protests across the U.S.
posted on Dec. 4, 2014, at 8:21 p.m.
Rumain Brisbon was shot and killed by a 30-year-old white police officer Tuesday evening in Phoenix after the officer, who has not yet been identified, mistook a pill bottle for a gun. Phoenix police released a timeline of the incident, which started with a response to a call about a possible drug deal and ended with Brisbon dead with two shots to his torso. Brisbon is survived by his four children and wife. Brandon Dickerson, who said he was in the SUV with Brisbon shortly before the incident occurred, said they were at the apartment to drop off food for Brisbon’s children. Police said they released the account to show transparency, especially in the wake of protests that have spread across the country after a Missouri grand jury’s decision on Nov. 24 not to indict Ferguson police officer Darren Wilson, who shot unarmed Michael Brown. That decision was followed by a grand jury in New York on Wednesday, which decided not to indict officer Daniel Pantaleo for his involvement in the chokehold-related death of Eric Garner. Witnesses and community leaders have already accused the Phoenix officer of using excessive force against Brisbon, contradicting the initial police account. A rally and vigil is planned for Thursday evening. Officers said they were in the area of Interstate 17 and Greenway Road for a burglary investigation when they got a call around 6 p.m. Tuesday from a resident of an apartment complex who said a drug deal was going down in a black SUV Cadillac parked outside, said Crump. When the unidentified police officer, a seven-year veteran, arrived at the SUV, he told Brisbon, who was the only person in the car at the time, to show his hands. According to officers, Brisbon instead put his hands in his pockets, prompting the officer to draw his weapon. Brisbon then ran toward the apartments, and the officer gave chase until they got into a struggle inside the apartment complex. Brisbon did not keep his hands in his pockets, so the officer fired two shots, Crump said. Inside Brisbon’s pocket was a bottle of Oxycodone pills. A witness, Martin Rangel, lives in the floor above where the shooting took place and said he heard banging and then a gunshot. The Maricopa County attorney’s office will decide whether the unidentified cop will face criminal charges. Brisbon has prior convictions for driving under the influence, marijuana possession, and burglary. He was serving a five-year probation sentence for the latter offense. Officers said they found a jar of marijuana and a handgun in the SUV. Marci Kratter, an attorney for Brisbon’s family, said they are considering a wrongful death lawsuit. A 37-year-old Cleveland woman died while in police custody outside her home last week after officers slammed her head on the pavement, her family said. posted on Nov. 18, 2014, at 4:13 p.m.
Law enforcement officials and the county medical examiner are investigating the death of a 37-old-woman who was killed last week following a confrontation with Cleveland, Ohio, police. According to family members and media reports, Tanesha Anderson died after officers allegedly slammed her head on the pavement as they attempted to take her into custody. The officers, whose names have not been released, were called to Anderson’s home on Nov. 12, after a family member said that Anderson was disturbing the peace. According to her family, Anderson was mentally ill and had been prescribed medication for bipolar disorder and schizophrenia. Her family wanted the police’s assistance in getting her to go to the hospital for an evaluation. The family and the police both said that after what the cops described as a “lengthy discussion” Anderson agreed to be escorted to Saint Vincent Charity Hospital for a psychiatric evaluation. As the officers escorted the female to the police vehicle she began actively resisting the officers. Once handcuffed, the woman continued to resist officers attempts to place her in the police car. The woman began to kick at officers. A short time later the woman stopped struggling and appeared to go limp. Officers found a faint pulse on the victim and immediately called EMS and a supervisor to respond to the scene at 11:34. The family’s version of what happened after Anderson and the cops began to struggle is different from the police account. Joell Anderson, the victim’s brother who told Cleveland.com that he witnessed the incident, said that one of the officers repeatedly pushed down on Anderson’s head while she resisted in the backseat of the police car. The officer then allegedly used a takedown move and pushed Anderson’s head on to the pavement, knocking Anderson unconscious. The officers made no effort to resuscitate her before EMS arrived, according to Joell Anderson, who said about 20 minutes passed before the ambulance arrived. According to police, Anderson was treated at the scene by EMS before being transported to Cleveland Clinic emergency room where she was pronounced dead at 12:30 a.m. local time. The Cleveland Division of Police Use of Deadly Force Investigation Team was notified of the incident and is investigating. The Cuyahoga County Medical Examiner’s Office is also investigating the cause of death.